This is, by the way, my very own personal kit. Apart from being the most economical solution I also thing that this is the best equipment I had so far in terms reliability, quality and conformability. It just fits my needs perfectly. Really confortable In-Ear Headphones that came with this fancy casing. Aren't Beyerdynamic but they just do the job in terms of monitoring. Also they have a very cool feature that allows you to have your H1 recorder hanging from your neck so: hands free. Cost: 25€ aprox. Amendment: Also if you feel that Earbuds are too lame I highly recommend Phillips SPH-2000 headphones, again extremely cheap and good quality gear. A couple of 20 cents piezoelectric capsules, a minijack connector, some clumsy soldering, a bit of plasti-dip sealing, and off you go with your contact mics ready to rock. Cost: 5€ or less. This is a casing for a product that could be found a few years back on the "Ikea Family" section, of the swedish company. 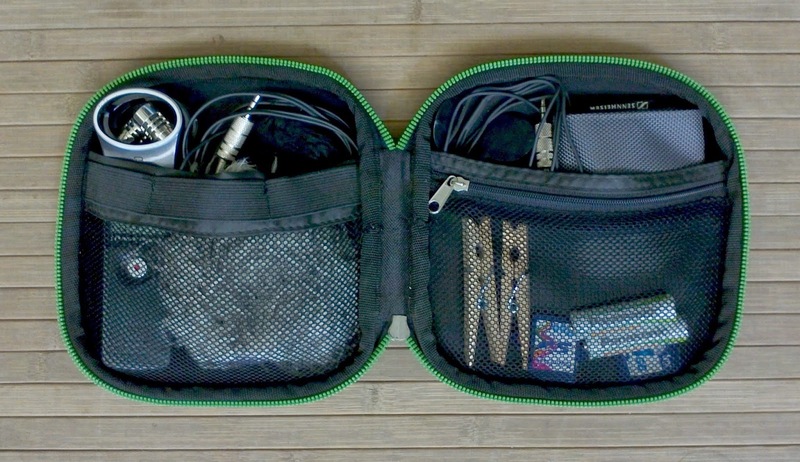 Its been discontinued but surely you can find a cooler casing for your gear. Mine was a Xmas gift from my dear Aunt. Cost: priceless. This is just for those windy days. The comercial ones are expensive but you'll end up needing it. Still you can find your way through buying some teddy bear fur a bit of foam and the good old grandma's sewing skills. Cost: if you are clever enough your grandma will do it for you. A fine, simple and extremely light-weight recorder that has a line input with plug-in power* and the ability of storing 8GB (or more, sky is the limit) of audio (44kHz 16bit, WAV) which is something rather insane. It just works with one battery and fits in your shirt pocket, awesome. Cost: 98€ aprox. * That's the keystone that allows you to connect external mics. Hyper-useful for a variety of situations. It not just holds the recorder even can be used as a mic stand for your Binaural PRO Microphones which I describe right after this. Cost: 5-7€. At Binaural PRO Microphones (Primo ECM 172 Capsules). Ok, those are my Binaural PRO Microphones with the absolutely-awesome Primo capsules that don't stop surprising me. Seriously a wonderful piece of electronics for a very low price. Again it just fits my purposes beyond what I had imagined. And, of course combined with the H1 it just makes the perfect match by-passing the lame X/Y internal microphones of the tinniest of the Zoom family. You need to connect the Bin Pro to a "plug in power" input, which basically provides 4.5v to the electret capsules to function. By the way, they are built with a moldable cable (which I'm very proud of) that can be wrapped or tied around any kind of surface. Cost: 60€ + shipping fees. PS: That's the sponsored bit ¿ok? Did I mention that we have to pay the rent? A must. Very very useful to attach your contact microphones to any flat surface. Also are very useful as mic clips for your Binaural PRO Microphones. I use it also to tie cables and not having the flying about. Cost: nothing, steal them from your neighbor. No need of presentations but always bring a couple or more with you. Even that on Zoom are very keen on saving energy (cannot say the same of Tascam twats) and making batteries last for ages, those die at last. Cost: 5€. Ok, apart form being a very low cost equipment this has become the best solution for me and a fundamental part of my gear. Of course I have better microphones and better recorder with better pre-amps and a totemic Røde Blimp and a boom pole to show up in festivals and to take very cool pictures of myself recording on the top of the cliff! BUT, trust me, 90% of the things I have done or recorded are made with this small kit and nothing else. The rest it's just marketing and Chris-Watson-Wannabe selfies. Without going further, here I leave you a composition made with recordings gathered yesterday with the stereo contact mics and the Binaural PRO Microphones through the Zoom H1. Hope you enjoy it.